Whether you're diabetic or looking to lose weight, it doesn't mean you need to cut the carbs you love out of your diet. It just means that you need to be able to trust that the food you buy and the companies that make them have your best interest in mind. 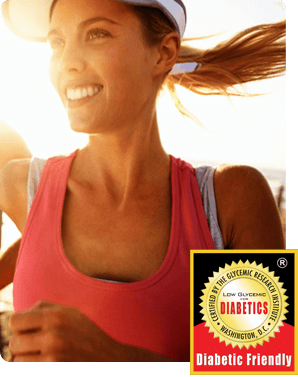 Above and beyond the health benefits of a low-glycemic diet, and meeting the strict standards of the Seal, we take more precaution and all the extra care and steps to provide you with the best tasting and most nutritious low-glycemic products out there. We use only use freshly sprouted certified organic whole grains and seeds, which helps your body digest more nutrients naturally found in grains. Our products are all kosher. For more information on low glycemic diets or diabetes, visit the Glycemic Index foundation or the American Diabetes Association.